Rates of atmospheric nitrogen (N) deposition are increasing rapidly in tropical regions, which are projected to receive some of the greatest deposition levels globally in the coming decades. Tropical forests on highly weathered soils generally have high N availability, so added N is not likely to stimulate plant growth. Instead, N addition to these soils may rapidly alter the availability of other scarcer nutrients like base cations, via displacement from soil exchange sites and mobilization into solution. We hypothesized that: (1.) 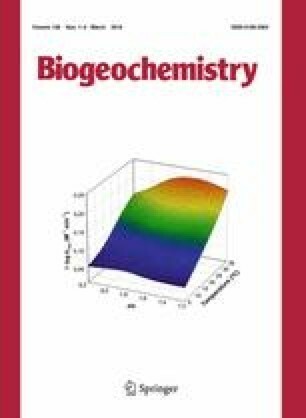 Addition of mineral N to highly weathered tropical soils rapidly mobilizes base cations into solution, with increasing fertilization effects over time. (2.) Nitrogen fertilization reduces cation availability on soil exchange sites, because of increased mobilization and loss down the soil profile. We assessed the short-term (1–2 year) and mid-term (4–5 year) effects of N fertilization on base cation mobilization to 40 cm depths in two distinct tropical forests. Over the first 5 years of the experiment, fertilization significantly increased calcium, magnesium, and potassium concentrations in soil solution, as well as all dissolved N chemical species. There was an increasing fertilization effect over time for all solutes across soil depths, suggestive of downward leaching. Comparing the two forests, there was no difference in the magnitude or timing of the fertilization effect on base cation mobilization, although dissolved N concentrations increased most rapidly in the upper elevation forest, where background dissolved N was also higher. Surprisingly, salt-extractable base cations also increased for fertilized versus control soils. Our results suggest that addition of mineral N to tropical forests on highly weathered soils is highly likely to mobilize base cations into solution, with subsequent leaching down the soil profile. These results imply that N deposition in tropical forests on highly weathered soils may exacerbate cation scarcity in these ecosystems, and could negatively affect long-term plant growth. Funding for this research was provided by the National Science Foundation DEB-008538 and DEB-0218039 to the Institute for Tropical Ecosystem Studies and the University of Puerto Rico as part of the Long Term Ecological Research site in the Luquillo Experimental Forest. Additional infrastructural and lab support were provided by the International Institute for Tropical Forestry, USDA-FS. Partial funding was provided by the New Hampshire Agricultural Experiment Station. This is Scientific Contribution Number 2657. This work was supported by the USDA National Institute of Food and Agriculture McIntire-Stennis Project 1006760. Comments from two anonymous reviewers greatly improved the manuscript.